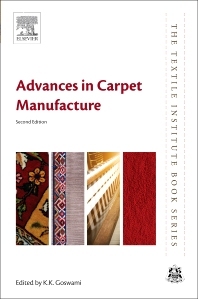 Advances in Carpet Manufacture, Second Edition, discusses the manufacture of carpets, an industry that has evolved over hundreds of years, also exploring the new changes and developments in textile science and manufacturing technology that occur every day. This updated edition provides revised, expanded and updated coverage of carpet manufacturing processes and applications. The book begins by reviewing the different types of carpets and their applications, also exploring the structure and properties of carpet materials. Carpet manufacturing techniques are then reviewed, including a new chapter on tufting and yarn manufacturing techniques, and design and manufacture for handmade carpets. Subsequent chapters review the development of carpets with important properties, including new chapters on carpets for acoustics and sound absorption, carpets with increased fire retardancy and those with antimicrobial and soil-resist finishes. With the variety of topics covered and its international team of contributors, the book offers a valuable and informative reference for technologists in the carpet and associated industries. However, it is also a great resource for researchers and students working in applied textile sciences. Professor (Dr) Kamal Kanti Goswami, C.Text, FTI is the Director of the Indian Institute of Carpet Technology (IICT), in India. He is inventor of a new form of carpet backing and contributed to the introduction of a more ergonomic loom and a new knot formation technique in carpet weaving, known as the India Knot.